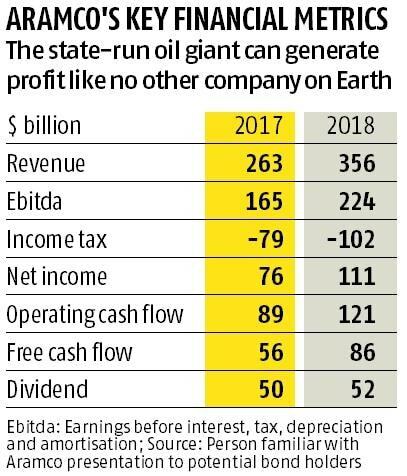 The first official glimpse of Saudi Aramco’s financial performance confirms the state-run oil giant can generate profit like no other company on Earth: net income last year was $111.1 billion, easily outstripping US behemoths, including Apple Inc. and Exxon Mobil Corp. But accounts published before the firm’s debut in the international bond market also show Aramco — an organisation that produces about 10 per cent of the world’s crude — doesn’t generate as much cash per barrel as other leading oil companies like Royal Dutch Shell Plc because of a heavy tax burden. 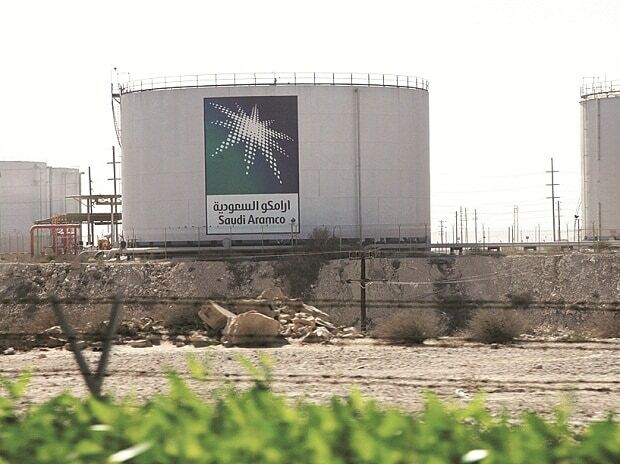 The bond sale, being pitched to investors this week in a global road show, has forced Aramco to reveal secrets held close since the company’s nationalisation in the late 1970s, casting a light on the relationship between the kingdom and its most important asset. Both Fitch Ratings and Moody’s Investors Service assigned Aramco the fifth-highest investment grade, the same as Saudi sovereign debt, but lower than oil majors Exxon, Shell, and Chevron Corp. The company is preparing to raise debt in part to pay for the acquisition of a majority stake in domestic petrochemical group Sabic, worth about $69 billion. The deal is a Plan B to generate money for Saudi Arabia’s economic agenda after an initial public offering (IPO) of Aramco was postponed. In effect, Crown Prince Mohammed bin Salman is using the firm’s pristine balance sheet to finance his ambitions. Aramco will pay 50 per cent of the Sabic acquisition cost when the deal closes and the rest over the subsequent two years, according to a person who saw a presentation made to potential investors on Monday. Aramco declined to comment. The kingdom’s dependence on the company to finance social and military spending, as well as the lavish lifestyles of hundreds of princes, places a heavy burden on Aramco’s cash flow. 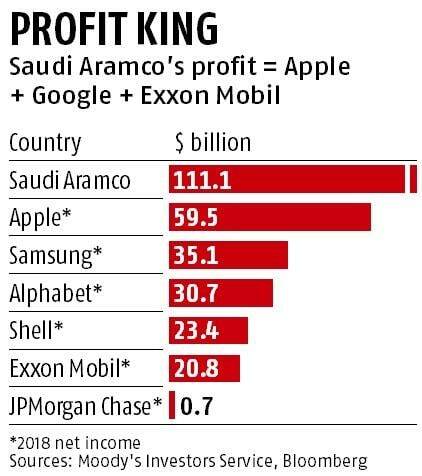 Aramco pays 50 per cent of its profit on income-tax, plus a sliding royalty scale that starts at 20 per cent of the company’s revenue.